Meadhbh Monahan discusses the talent, pride and enthusiasm of the military instrumentalists with the Director of the Defence Forces School of Music and members of the Army Number One Band. From state visits and ceremonial parades to sporting events, the crisp uniforms and upbeat melodies of the military bands are an essential ingredient. Few could forget the sense of gravitas that accompanied their rendition of the British and Irish national anthems during Queen Elizabeth’s historical state visit in May 2011. Indeed, their presence is expected and enjoyed at many high profile events such as presidential inaugurations, state funerals, St Patrick’s Day parades and the annual Dublin horse show. The Army Number One Band was established in Dublin in 1923, after then Chief of Staff General Richard Mulcahy called for “bands that will dispense music … in the highest terms to the people.” Its first Director was celebrated German military musician Colonel Wilhelm Fritz Brase, who had been Germany’s Royal Music Director. The Number One Band was soon accompanied by the Band of the First Southern Brigade in Cork, the Band of the Curragh Command and the Band of the Fourth Western Brigade in Athlone. 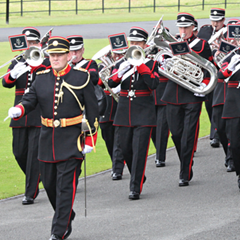 Following a reorganisation of the Defence Forces in 1997, the Curragh band was disbanded. The 97 members of the three bands currently perform at approximately 500 state, military and civilian events annually. Separate from soldiers in other army corps (such as infantry or cavalry), the members of the military bands are ‘direct entry technicians’. It is a “specialised job” and “they don’t have any other duties other than playing in the band,” explains the School of Music’s Director, Lieutenant Colonel Mark Armstrong. “They wouldn’t have time,” he adds, pointing out those rehearsals and performances are constant, and often take place at weekends and evenings. Infantry soldiers make up the Defence Forces’ nine pipe bands and are trained by the School of Music. Lt Col Armstrong is responsible for overall music policy in the Defence Forces. This includes choosing music, obtaining up-to-date sheet music and instruments, recruitment, liaising with the Taoiseach’s department and President’s office and supervising requests from ‘civilian hirers’. In its early days, the band consisted of young boys, often from industrial schools such as Artane, who were taught how to play an instrument from scratch. Lt Col Armstrong notes that “the standard of playing has improved dramatically” with many entrants having a degree or masters in music or having experience in solo recording or playing with the RTÉ and National Symphony Orchestras. The minimum entry requirement for nstrumentalists is an Associated Board or Irish Academy grade eight while a conductor must have a primary degree in music. “I’m really glad I took the plunge; it’s a good solid job,” says the newest recruit, bandswoman Jane Hilliard, who was among the “handful” of new members employed in the current economic downturn. After completing a degree in the Royal Irish Academy of Music, Hilliard was freelancing as a trumpet player. Following six weeks of gruelling military training, including fitness tests, she gained entry to the Army Number One Band. “Getting used to the military way of life was difficult but it was good preparation for being in the band,” she tells eolas, remembering how she learned the Irish commands such as ‘Aire’ (attention) by the tone of voice. Hilliard began just in time for the inauguration of President Michael D Higgins, where she played in both the inside and outside bands. “Playing in the lashing rain was very tough; that was my first experience of just getting on with it,” she recalls. Marching while playing the cornet is still taking a lot of getting used to and fitness is a must, she explains. On military discipline, which is constantly drilled into the instrumentalists, Hilliard says: “You can’t question anything, which I thought would be difficult, but you get used to it. You’re there for a reason and everyone is always delighted to see the band.” For example, at the inauguration, while her mother was thrilled to be watching her daughter on TV, the heat was causing Jane’s head to throb but she dared not reposition her hat in case the camera caught her move. Lt Col Armstrong understands, saying: “We have to be adaptable. We must be able to stand in the rain and play at a state funeral in the morning and then go into the National Concert Hall in the evening and sit down in concert dress and play to international standards.” Being a member of the army band “requires the most versatility of any professional musician,” he contends. For flautist Sergeant Justin Mason, the fitness, dedication and performing at high profile events comes as second nature. In his 21 years as bandsman (three of which were spent in Athlone) he has played at Bill Clinton’s visit, the inaugurations of the last two presidents and that of Michael D Higgins and the Queen’s visit. The fact that his father spent nine years in the British Army’s Irish Guards and his older brother has served 28 years in the Defence Forces, meant that the young Mason knew what was to be expected of him. Last year was very busy for the bands, particularly with the Queen’s visit. “A lot of thought went into the music and the drills,” Lt Col Armstrong comments. 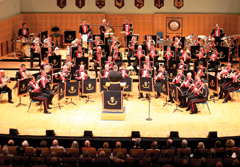 The bands got “a great response” from that visit, notes conductor Captain Declan Whitston. It is common for the band to travel for over an hour, wait around for an hour, play for five minutes and then travel home. It is essential that the musicians are ready to ‘switch on’ for those five minutes and “be at your optimum performance level,” Capt Whitston remarks. School visits are a favourite. “My favourite type of gig is the schools. I love to see the little kids who are always fascinated, and it’s a bit relaxing,” comments Jane Hilliard. A letter received from school children, including pictures of the instruments, stands out in Captain Whitston’s mind. “We receive letters of thanks from little kids right up to the President’s office,” he laughs.